The new Duchess Meghan of Sussex is getting a master's-class lesson in her new royal job — from Queen Elizabeth II, no less — with an unprecedented invitation to board The Royal Train for a day of solo engagements with Her Majesty in Cheshire on Thursday. After an overnight rail trip Wednesday, the 92-year-old monarch and her 36-year-old granddaughter-in-law arrived in northwest England, about 165 miles from London, with a to-do schedule that includes a variety of typical royal engagements: They're opening a new bridge, visiting a theater and having lunch with local big-wigs. Queen Elizabeth II is greeted with Meghan, Duchess of Sussex as they arrive by Royal Train at Runcorn Station to open the new Mersey Gateway Bridge on June 14, 2018 in the town of Runcorn, Cheshire, England. It's not unusual the queen would schedule a day of engagements with a new member of the royal family, although it is somewhat early: The American-born duchess married the queen's grandson, Prince Harry, now Duke of Sussex, less than a month ago, on May 19, in a spectacular wedding that blended royal tradition and American zest. 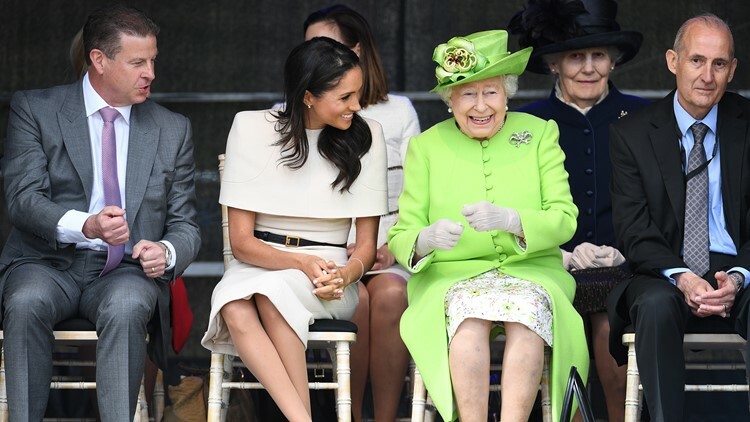 The queen is making sure Meghan gets all the help she might need in adapting to her new royal duties — and who better to show her the ropes than someone who's been on the job since she was a teen princess. 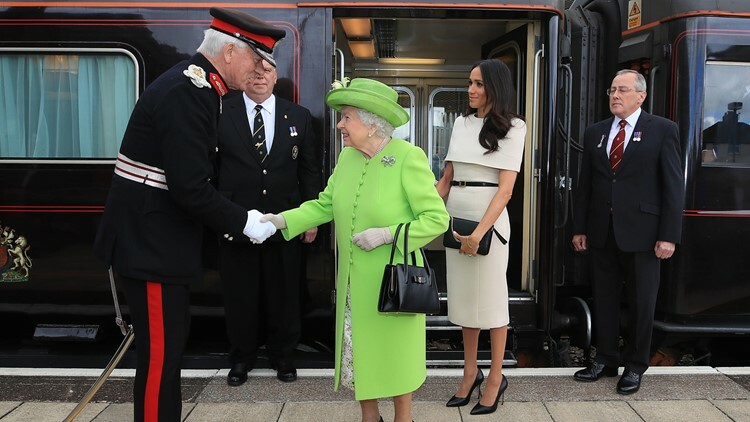 The unusual part of this royal day-away is that Meghan was invited to accompany the queen to Cheshire (think the Cheshire cat from "Alice's Adventures in Wonderland") via her favorite mode of transport, her Royal Train. It's a distinct privilege: Not even beloved Harry, 33, has been invited to use the train. That's because the Royal Train (this one dates from 1977) is exclusively reserved for use by the top four royals: The queen, her husband, Prince Philip, her heir, Prince Charles (Meghan's new father-in-law), and his wife, Duchess Camilla of Cornwall. Prince William and his wife, Duchess Kate of Cambridge, haven't been invited to use the train, either. The queen, who no longer travels on long-haul visits abroad, uses the train in Britain for long-distance engagements, traveling overnight from near London in the train's specially equipped, claret-colored "saloons," as the British call the carriages. And don't imagine they're saloons in the American Wild West sense. The queen's saloon features a sitting room (with a desk for going through her red boxes), a bathroom (fitted with a royal tub) and a bedroom decorated in soft pastel colors, lace pillows, Scottish landscape paintings and prints of royal trains of the past. 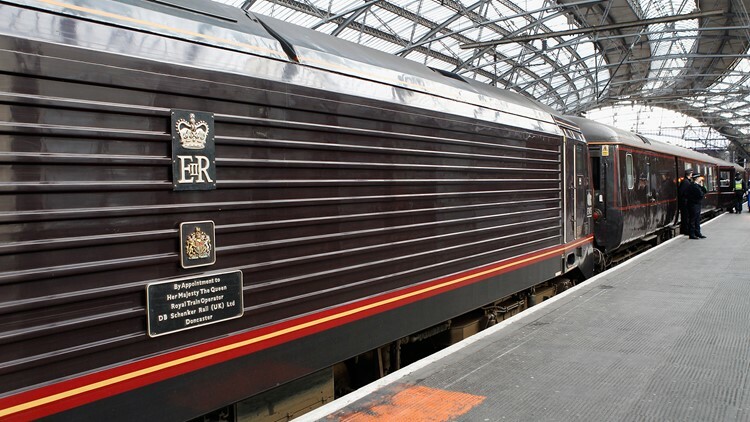 The Royal Train is one of the last transport perks the royals enjoy, after the much-loved royal yacht, the Britannia, was retired in 1997 — a cost-cutting move that prompted royal tears, even from the famously reserved queen. One sign of how much the family cared about the Britannia: A century before, historians say, the queen's great-grandfather, Edward VII, wanted the Royal Train to be as much like the royal yacht as possible. The royals also have access to a helicopter for short hops inside Britain, and can use various Royal Air Force VIP jets when traveling abroad, as Prince William will do when he visits the Middle East later this month. Harry and Meghan will likely do the same when they travel Down Under this fall in an official visit to Australia, New Zealand, Fiji and Tonga. But the Royal Train is a cozy luxury in a train-dependent nation, not to mention a critical security requirement. Queen Victoria was the first British monarch to ride a train, in 1842, and quickly understood its usefulness. For the last 150 years, some version of the train has been a mobile residence/office for monarchs riding the rails of their kingdom. Even so, cost-cutting has reduced the train from its previous 14 carriages to the total of nine available for use today. The Prince of Wales has used the train most often lately. A design aficionado, Prince Charles was closely involved in designing the Wales saloons: They were constructed in 1983-1985 for Charles and his first wife, the late Princess Diana, Harry and William's mother. According to royal historians, Charles' saloon has a photo of the Britannia above his bed.